Ellen Reesor is a farm girl from Stouffville, a musician, an actress, a lover of all things artistic, and a yoga teacher. Her first yoga class was 14 years ago, when she found that she could barely hold a downward dog. Though tough, she quickly fell in love with the way yoga made her feel. Ellen found herself attending yoga classes more and more determined to improve her practice and learn new things. Eventually it just made sense for her to broaden her practice by completing a teacher-training, so she attended a 200-hour YTT in Hatha yoga. After her first training, Ellen took a couple of years to dive into teaching and find her voice. She then went on to complete a 500 hour Moksha Yoga teacher training as well as a 100 hour Moksha Yoga Flow training. Ellen considers herself an eternal student and is constantly attending workshops and trainings to learn more. 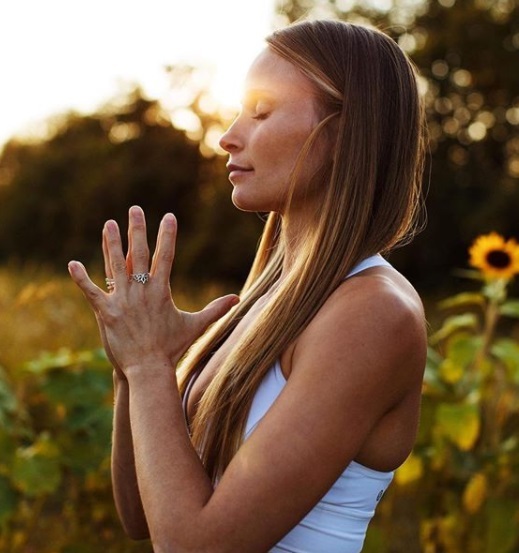 Over the years, yoga has deeply enriched her life mentally, physically and spiritually, and she continues to find fulfillment in helping others to find the same joy that yoga has brought her. I LOVE climbing. If I’m not on my mat you'll find me climbing rocks, and If a week has gone by and I haven't climbed something I start to get really antsy. Climbing is a passion of mine and I train really hard for it! I've been told growing up that I have exceptional resilience. I'm not sure why I inherited this quality but even as a young girl I was always able to find a reason for the painful parts of my life and knew i was supposed to learn from them. I always had this deep rooted belief that good comes from bad. This strong acceptance of struggle gave me the courage to move forward and trust in the process of life, be it good or bad. This quality is what eventually lead me to start my own business. My current business goal is to invest in a large plot of land and create a retreat center where people can come for weeks or months at a time to heal. I want it to be close enough to the city that it's easily accessible, but also tucked away in nature so it feels far away from everyday life and safe.. I want to incorporate art therapy, psychology, yoga therapy, gardening, and outdoor education to empower people who struggle with all kinds of mental, spiritual or physical barriers in life. My personal goal is to get rid of my ego...or at least discipline it haha. I laughed when I saw a t-shirt that said "your ego is not your amigo". It's so true! This world would a much better place if we could each focus a little less on ourselves and a little more on others. Every day is full of successes and failures, how do I choose one? I suppose if I have to choose a specific accomplishment it would be opening KIND. I remember there were many classes in the first year where no one showed up and rather than seeing it as a failure I used that time to practice yoga and pray, putting positive intentions for the studio out there. Now I can't imagine our town without KIND. It's changed countless lives and its an enormous source of joy and peace for many lives. KIND is making a positive impact on the world and that's something I am okay with being proud of. My upbringing was far from easy, but so many of the challenges shaped me into who I am today. I think we are all given challenges that are there to help us grow and evolve, our challenges are our lessons in life. I also believe that every time we shy away from those lessons, they keep coming back until we are ready to face them and move onto the next lesson or challenge. Every Friday night at the studio we run a yoga class and group therapy session for those who struggle with addiction/mental illness or for anyone affected by someone with addiction/mental illness. We always begin our gatherings with the serenity prayer and I've found it helpful. I think all humans can benefit from this motto: "Lord grant me the strength to accept the things I cannot change, the courage to change the things that I can and the wisdom to know the difference". I’ve travelled a lot and still my favorite destination is my home, Canada. There is endless beauty here from mountains to prairies, oceans to great lakes, city to country... It’s gorgeous! I`m an ambassador for lululemon and I genuinely love their clothes! They`re a company I`m proud to stand behind. I’ve come to learn that they are so much more than black stretchy pants! ROCK CLIMBING. If all goes as planned I`ll be practicing yoga and climbing until I’m 90! Haha.